Chilean guitarist Cler Canifru might just be one of the busiest guitarists in South America. 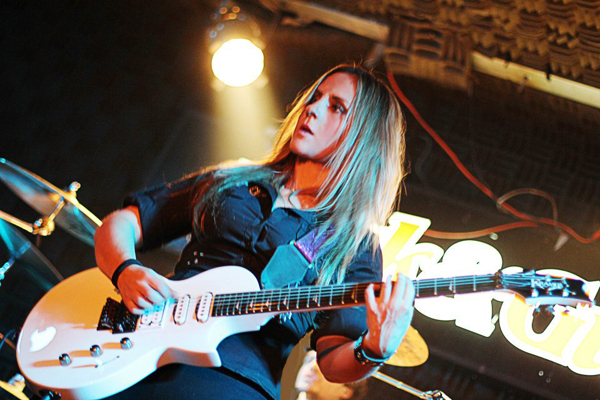 She has a Bachelor of music with a major in electric guitar. Cler plays guitar for many renowned musicians such as Chilean producer Philip Foncea (alternative rock), the progressive metal band Gabriel Hidalgo, and Mariano Pavez (pop-rock-electronic), which made it into the program for the 10 most requested on the MTV Channel for Latin America with the band "Bat" on two occasions. First in the year 2010 with the single “Give Me More” and in 2011 with the single "Bipolar" Cler has also just joined the band FOS, a new style of alternative pop rock. 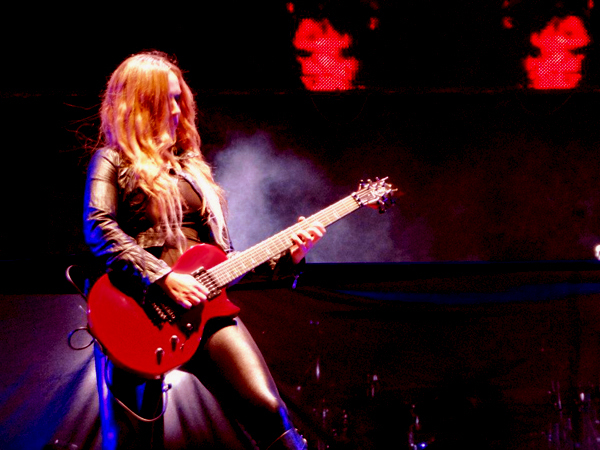 Cler is also still a stable part in the band for the Chilean singer Myriam Hernandez (pop) on two tours through Latin America (Falling in Love "with me" 2010 Tour and "Seducción" Tour follow-up 2011 and 2012). 1. You're in so many projects! What are you up to right now? At this time I find myself preparing my solo album, which I plan to release the second half of this year. I'm creating and recording now and it's going to be pretty rocking with some Tom Petty and Grunge influences. Also I'm resuming the "Seducción Tour" throughout South America with Myriam Hernandez (Chilean singer), we are going to be in Colombia, Peru, Bolivia, Argentina, Ecuador, Panama, Dominican Republic, USA, among others. On the other side I'm recording the second album with the band FOS and we also have some tour dates on the schedule in Chile and other countries, but they are not jet confirmed. With the Band "Hidalgo" (progressive metal) we are soon going to be working on our third record. 2. Who are your favorite players and why? I have trouble picking just one, because I have a lot of influences from different guitar players. But I'm picking Slash and Wayne Krantz. I pick Slash because his solos where the first ones I started to play when I learned to play guitar, he was my inspiration hehe. Also, I like the way he creates the solos and the language he uses. If you listen carefully you can sing every solo and they are memorable, there's no solo that you listen and then forget how it goes. He has an extraordinary feeling. My second pick is Wayne Krantz, he is a jazz fusion guitar player and I'm picking him because of the groove he has is incredible. I like the importance of the rhythms that he gives to the solos and to his songs, more than melody. I could say that both of themes are one extreme to another, but I like them and I've been influenced by equally by both. 3. What made you want to first start playing? From a very early age my father started teaching me how to play guitar. He was a rocker when he was young and he also played jazz. I remember that he had a great jumbo jazz guitar that he taught me on, he didn't care that my hand was smaller than the frets hehe. Later he gave me a child’s guitar that was smaller and more comfortable, but I was used to the big guitar so I never used the small one. 4. Who are you currently listening to? If I take a look to my music player, I find Alains Johannes, Chris Cornell, the new album from Europe, Alter Bridge, Shinedown, Elliot Smith, among others. 5. What do you love about your Kramer? I love the comfort and the sound. I work a lot as a session musician, so I'm constantly playing a lot of different styles, from pop to progressive metal and with Kramer, any style that I have to play fits with the guitar. The Assault is a guitar I feel comfortable on. 6. Do you have any tone or playing tips? I use different tuning with the different bands I play with. For "Hidalgo", that is progressive metal and I use one of my Kramers tuned to B. In the other bands I used standard tuning. What I recommend is to learn a lot of solos from different guitar players; you can help yourself with tabs or by ear. It is very useful to develop a wider language on the instrument and with time you can find your own sound. Head over to Cler's website and check out her music. Then head over to her FB and click the like!